What is magnitude in Science? Intensity:The severity of earthquake shaking is assessed using a descriptive scale – the Modified Mercalli Intensity Scale. Magnitude: Earthquake size is a quantitative measure of the size of the earthquake at its source. 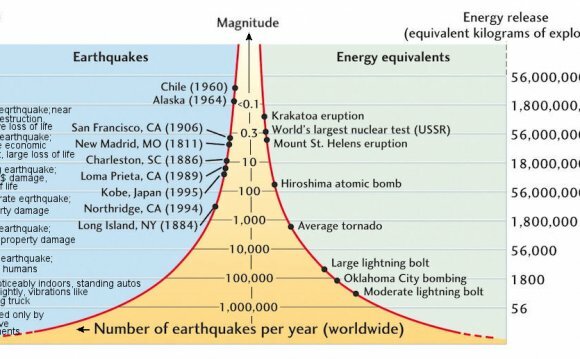 The Richter Magnitude Scale measures the amount of seismic energy released by an earthquake. When an earthquake occurs, its magnitude can be given a single numerical value on the Richter Magnitude Scale. However the intensity is variable over the area affected by the earthquake, with high intensities near the epicentre and lower values further away. These are allocated a value depending on the effects of the shaking according to the Modified Mercalli Intensity Scale. In an example, Magnitude can be likened to the power of radio or television waves sent out from a broadcasting station. Intensity is how well you receive the signal, which can depend on your distance from the energy source, the local conditions, and the pathway the signal has to take to reach you.